Christmas, the great feast of Christianity, is celebrated throughout the world in different ways. Prior to the advent of technology, literature was the only way to document culture-specific traditions concerning Christmas, which eventually emerged as the ideal setting for fairy tales, short stories and novels. 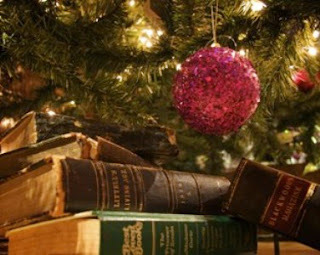 Despite their differences, a multitude of works, from Charles Dickens’ Christmas Carol to Nikolai Gogol’s Christmas Eve and Agatha Christie’s The Adventure of the Christmas Pudding, all attest to the fact that this period of year signifies a closure, a time of resolutions and decisions on a universal level. Greek Literature includes a great body of works whose focus is Christmas, imbued by the religious spirituality closely linked with the Greek psyche. In the short story Divine Vision, Andreas Karkavitsas -a naturalist and folklorist writer of the early 20th century- tells the story of an unexpected vision of the Virgin Mary she has on the night she gives birth to Jesus Christ, which includes even His sacrifice. Photis Kontoglou, an "emblematic Orthodox painter and novelist," in the short story John the Blessed shows St. Basil (Santa Claus in the Greek tradition) disappointed by human indifference finally finding hope in a young man - a shepherd whom they used to call Yiannis the blessed: "an innocent man like the sheep he herded, completely illiterate." In his narrative Christmas in the Cave, Kontoglou describes how two hunters, three seamen and two monks got together with a group of shepherds in a cave to spend Christmas Eve. In addition, Kontoglou’s Christmas Eve - part of the collection of short stories entitled Ayvali, My Homeland - recounts with sensory details and vivid descriptions the festive atmosphere of his hometown Ayvali during Christmas, comprising a nostalgic reference to the time and place of the writer’s childhood in Asia Minor. Penelope Delta -a distinguished figure of Greek literature and practically the first writer of children's books in Greek- takes her readers to Messolonghi at Christmas of 1822. The story describes the failed attempt made by the Ottoman army under Omer Vryonis to capture the strategically located fort of Messolonghi, attacking its inhabitants on Christmas day, hoping to catch them by surprise while attending the early morning service. In the story Once at Christmas Time, prolific writer and playwright Grigorios Xenopoulos, reminisces with humour about his childhood and family at Christmas, in conjunction with the traditions and customs of his birthplace, the island of Zante. In particular, he describes how, when he was a student in Athens, he used "to celebrate Christmas on New Year’s Day," because that’s when he received a package from his mother with the traditional kouloura -a type of bread people eat in Zante on Christmas day, which is made of semolina, scented with saffron (krokos in Greek) sprinkled with icing sugar. No other Greek writer has managed to internalize the paradigms of magical realism as masterly as Alexandros Papadiamantis has. Born on the island of Skiathos -the locus of his work- Papadiamantis made his living translating great authors such as Dostoevsky. Steeped in biblical allusions, his fiction transports us to the ambience of the mythos of Greece’s past. Yet, beneath the façade of pastoral dalliance, Papadiamantis wrote with unparalleled passion about the plight of alcoholism and the ravages of women deserted by their husbands and sons. A variety of short stories, the auteur’s signature genre, pivot around Christmas and its significance. The American tells the story of an immigrant who returns after 25 years to his native island only to find the shambles of his house and his past. This is an example of how Papadiamantis uses the mythical method, since the plotline parallels the second half of the Odyssey. On Christmas Eve, he wanders around the port with one single hope –that his love is still waiting for him. In the end, the American reunites with her in one of the few Papadiamantian stories with a happy ending. The Gleaner recounts the life of an old widow whose only earnings come from hard work in the fields. Christmas is nigh though, her two sons have drowned at sea, her daughter has died at childbirth and her third son "the idler" has immigrated to the US, leaving her with the burden of raising her two grandchildren alone. Yet, she has no money left, the winter is harsh and she is totally destitute. It is then that a deus ex machina check is sent to save her by her long-gone son who lives abroad. Love in the Snow is another Christmas tale about a poor, lonely man whose only companionship is alcohol, which dulls the pain of his devastated life. Again, the only salvation is love, and specifically his love for the flour mill owner. In the end, the hero dies on the Eve of the day of the Epiphany, covered by the snow, which purifies his existence. Alluding to Joyce’s The Dead and Chekhov’s Heartache, this is a unique story of the tragedy of loneliness, which transcends cultures and centuries.